Mango Compressed Mattresses are compressed and vacuum sealed in order to fit in a box for convenient shipping directly to your home. After the mattress arrives, all you have to do is open the vacuum seal and the steal coils will expand within seconds. You now have a comfortable mattress ready for use without the hassle of picking it up at the furniture store and maneuvering it through the house. Individually Wrapped Coils Prevent Motion Transfer and Adjust for Proper Spinal Support and Alignment. Meets the requirements of 16 CFR (federal flammability (open flame) standard for mattress sets) when used without a foundation. Available in Twin, full, queen and king size. 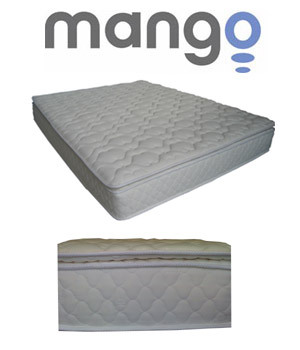 Competitive Edge Products, Inc. is an authorized retailer of the Mango Compressed Mattress. Dimensions: 44" x 19" x 19"